The pilot who buzzed Griffith Stadium was the Washington Senators’ once and future right fielder, Lieutenant Buddy Lewis, who had visited his teammates on a day off from the Army Air Force and was heading back to his base. The ballpark stood less than two miles from the US Capitol and the White House. If Lewis pulled that stunt today, he’d be looking at a surface-to-air missile or, if he was lucky, a court martial. He got off with a reprimand. There was a war on. Lewis missed 3½ years of baseball while serving in World War II. A speedy left-handed batter, he joined the Senators when he was 19 and spent his 11-year career with the team. He retired at 33 with a batting average just below .300. He could have played longer, but said his death-defying wartime experiences took away some of his enthusiasm for the game. Buddy rode his bicycle into town to play ball on a Junior American Legion team beginning when he was 12. After a year at Wake Forest College, he was the captain and star third baseman on the Post 23 team that advanced to the Legion World Series in 1934. As the outstanding player in the series, he won a tryout with the New York Giants. He traveled with the Giants for several weeks, but manager Bill Terry wanted nothing to do with the teenager. By some accounts, Terry ordered him off the field.3 The only highlight of his stay was watching Carl Hubbell strike out five future Hall of Famers in a row in the All-Star Game at the Polo Grounds. A spectator who saw Lewis in the Legion series recommended him to Joe Engel, owner of the Southern Association Chattanooga Lookouts, a Washington farm club. Engel paid the boy’s $11 train fare to Chattanooga and signed him. He received no bonus, but Engel did buy him a new glove. 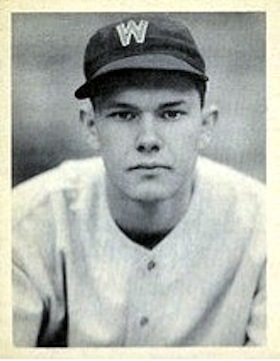 Lewis was just past his 18th birthday when Engel put him into the Lookouts’ lineup at third base late in the 1934 season. He went 7-for-21 in 10 games against Class A pitching. The next spring he won a regular job, but had to be talked out of quitting because he was homesick. He hit .303 with 40 doubles, 11 triples, and 9 home runs. The Washington club, most often called the Nats, brought Lewis up in September. In his major league debut, a month after he turned 19, he was sent up to pinch-hit against the White Sox’ 43-year-old Sad Sam Jones, who had started pitching in the majors before Lewis was born. Lewis popped out to shortstop. In 1938 Lewis made his first All-Star team and registered career highs with 12 homers and 91 RBIs. His defense was another matter; the Washington Post’s Shirley Povich called him “something of a butcher.”8 His range was slightly above average, but he was scatter-armed and ranked near the top of the league in errors every year. In August 1938 he was charged with 13 errors in a humiliating stretch of nine games. Four of them came in a doubleheader against the Yankees on August 16. Two days later he committed four more in another doubleheader. Lewis finished the year with a league-leading 47 errors. He and his roommate, Cecil Travis, usually went to Washington together after New Year’s to visit Griffith and sign their new contracts. By 1939 Lewis was said to be the club’s highest-paid player, although he was most likely making less than $15,000. Travis, a quiet Georgia farm boy who also batted left-handed, was among the leaders in batting average but lacked Lewis’s speed and extra-base power. Even in the middle of the lineup, he was not a big RBI man. He had turned into an acceptable defensive shortstop despite high error totals. The two friends were forced to change positions in 1940 when the Nats acquired Jimmy Pofahl, a highly touted minor league shortstop. Travis moved back to third base, and Lewis had to learn to play right field. His arm proved more useful out there; he led the league’s right fielders in assists four times, but still committed a lot of errors. When Pofahl failed to hit, Travis went back to short and Lewis played a little at third as the club searched for a reliable infielder. With all the shuffling, both continued to hit at their usual level. In 1941 Travis exploded into stardom. His .359 batting average was second in the majors to Ted Williams’ .406 and better than Joe DiMaggio’s .357 despite DiMaggio’s 56-game hitting streak. Lewis and Travis were playing on borrowed time that summer. They had received draft notices, but since the United States was not yet at war, they were deferred until the end of the season. By the time of the attack on Pearl Harbor, Lewis had already joined the army. Travis was inducted soon afterward. Washington, losing its two best players, was hit harder by the draft than any other team in 1942. The Nats fell to seventh place. Lewis, who had taken some flying lessons, hoped to become a fighter pilot, but at the time the army required pilots to have a college degree. He went through basic training with a tank unit. The education requirement was soon dropped, and he was transferred to the Army Air Force. Travis was put in the infantry. While the war took an emotional toll on Lewis, it damaged Travis physically and cut short his baseball career. Rather than fighters, Lewis was assigned to the Air Transport Command. He was disappointed, but ended up flying some of the deadliest missions of the war: over the Hump. Lewis joined an elite unit that towed gliders carrying air commandos, who landed behind enemy lines to disrupt the Japanese plan for an invasion of India. The C-47 pilots had to retrieve the commandos when their missions were done, swooping low over makeshift jungle airstrips to snare the gliders with a skyhook and ferry them home. Lewis named his plane “The Old Fox,” Clark Griffith’s nickname. He survived 369 missions before he was discharged as a captain, decorated with the Distinguished Flying Cross and the Air Medal with oak leaf cluster. Released by the army at Fort Bragg, North Carolina, on July 20, 1945, Lewis hustled to Washington and reported to Griffith Stadium the next day. He was back in right field six days later, shortly before his 29th birthday. The Nats were in a pennant race for the first time in his career. It took him a few games to find his “classic batting stroke,” but then he went 7-for-13 in a series against the White Sox and took off on the run of his life. The Nats took off, too, starting a seven-game winning streak soon after Lewis returned and playing better than .600 ball the rest of the way. They fell just 1½ games short of the pennant, finishing second behind Detroit. With other servicemen back in baseball flannels in 1946, Lewis turned in a typical year: .292/.359/.421. The highlight was a 17-game hitting streak. But Cecil Travis was a shell of the .359 hitter of 1941. He was said to have suffered frostbitten feet during the Battle of the Bulge. He denied that, but acknowledged that his feet swelled and became chronically sore from spending many freezing winter nights in the open. Travis hit .252 in 1946, .216 in 1947, and retired at 33. Fans chose Lewis as the American League’s starting right fielder in the 1947 All-Star Game. Sharing the outfield with Ted Williams and Joe DiMaggio, he said, “I was in high cotton, boy!”13 But he tailed off badly in the second half to finish at .261/.330/.342, bothered by a bruised hip and distracted by off-field pressures. He was part-owner of a Ford dealership in Gastonia, and the business was in trouble. After the season he bought out his partner and quit baseball to run the dealership full time. He retired at 31 with a lifetime batting average of exactly .300 and exactly 1,500 hits. Retirement didn’t stick. “I never realized how much the game was a part of me until I stayed out of it last season,” Lewis said. “When I saw those lineups and scores in the papers, I felt lonesome for baseball.”14 He had found a new business partner who could take care of the dealership, and returned to the Nats in 1949 with a $16,000 contract. The comeback was not a success. A leg injury in May limited him to pinch-hitting for more than a month, and then he was in and out of the lineup. One reporter wrote, “Buddy’s legs had lost some of their sprightliness.”15 Lewis did go 10-for-26 as a pinch-hitter, but his .245 batting average dragged his lifetime average down to .297. When Washington manager Joe Kuhel was fired after a last-place finish, Lewis’s name surfaced as a possible successor. Instead he returned home to his businesses, which included a bowling alley as well as the dealership. Lewis had been a bachelor throughout his baseball career. On November 10, 1951, he married Frances Oates of Gastonia. They had daughters Kelly and Carol and a son, John Michael. On beach vacations the children liked to bury their dad in the sand. While tending to his business, Lewis kept his hand in baseball as area commissioner for American Legion ball. He, Bob Feller, and the Cubs’ Phil Cavaretta were the first graduates of the Legion program to make their marks in the majors. Lewis was a sponsor and assistant coach of the Gastonia Post 23 team, the same one he had played for, when it lost in the national championship game in 1954. In 1963 Lewis took over as head coach, assisted by former big leaguer Crash Davis. Gastonia was defeated in the state championship finals. Lewis was elected to the North Carolina Sports Hall of Fame, and the city of Gastonia named its American Legion baseball field after him. He was 94 when he died of cancer on February 18, 2011. The pioneer sabermetrician Bill James lists Cecil Travis and Buddy Lewis among the players who lost a shot at the Hall of Fame because of their wartime service.17 Travis was a high-average hitter, the kind of player Hall of Fame voters love, and had a chance for 3,000 hits if he had not missed almost four full seasons and come home damaged. The 3½ years Lewis missed should have been the prime of his career — ages 25 through 28. He lost at least three more seasons because of his early retirement, which was a result of the war. All this is speculation; inventing an alternative past is as futile as predicting the future. Cunningham, Bill. “Local Boy Makes Good.” Collier’s, September 12, 1938. “Flying the Hump.” China-Burma-India Hump Pilots Association, 2005. http://www.cbihpa.org/history.html, accessed September 23, 2016. Gilbert, Bill. They Also Served. New York: Crown, 1992. “John Kelly Lewis, Jr.” Charlotte Observer, February 20, 2011. GenealogyBank.com, http://genealogybank.com/doc/obituaries/obit/1358C754B066F9D8-1358C754B0..., accessed September 1, 2016. Zimmerman, Dwight Jon. “Operation Thursday and the 1st Air Commando Group.” Defense Media Network, May 10, 2015. http://www.defensemedianetwork.com/stories/rise-to-the-challenge-the-1st-air-commando-group-and-operation-thursday/, accessed September 19, 2016. 1 Francis Stann, “Win, Lose or Draw,” Washington Evening Star, February 27, 1950: 15. Lewis’s flyover occurred in the second game of a doubleheader on June 27, 1943, at 4:30 p.m., according to Shirley Povich of the Washington Post. 2 Some sources say Lewis was nicknamed “Buddy” after the Washington second baseman, Buddy Myer, who was a mentor, but Lewis was called “Buddy” when he was playing for Chattanooga. 3 Bill James, The New Bill James Historical Baseball Abstract (New York: Free Press, 2001), 564. Other accounts say the Giants offered him a contract, but balked when he asked them to pay his way through college. 4 Rick Van Blair, “Buddy Lewis: His dream came true, but war cut it short,” Sports Collectors Digest, July 31, 1992, 200. 5 Shirley Povich, “This Morning,” Washington Post, January 25, 1945: 10. 6 “Honors Given Nat Rook by Grif,” Washington Evening Star, October 25, 1936: 28. 7 Povich, “Can Buddy Lewis Come Back?” Baseball Digest, April 1949, 51. 8 Povich, “This Morning,” Washington Post, May 14, 1940: 19. 9 Theodore White, “The Hump,” Life, September 11, 1944. http://www.cbi-theater.com/life091144/life091144.html, accessed September 23, 2016. 10 Matt Schudel, “Baseball star of ’30s and ’40s also served as World War II pilot,” Washington Post, February 27, 2011: C7. 15 Burton Hawkins, “Win, Lose or Draw,” Washington Evening Star, September 3, 1949: 9. 16 Ragan Robinson, “Major leagues and a major legacy,” Gaston (North Carolina) Gazette, February 19, 2011: 10A.